Running is a fun sport, but it can be hard on the body. Those who have plantar fasciitis or other conditions of the feet may find relief in their favourite pastime by using the Alter-G treadmill. What is this kind of treadmill? Well, it allows you to adjust both gravity and speed to reach an acceptable workout level. By simply setting the machine to a 60 percent gravity rating, some say it feels like walking on the moon. Actually, it makes running feel so natural. If you have tried many other treadmills and have had no luck, the Alter-G may be the answer for you. These treadmills were once difficult to locate. They have been gaining in popularity recently. These machines will take some time to get used to them. After starting any routine, many find that their glutes, hamstrings, and hips are sore. While the body doesn’t fight gravity with these machines, the legs move so fast that you will be running fast enough to do a mile at a 5:30 pace, and you might not even recognize it. It is interesting to note that the hamstrings strain occurs from slowing down the swing leg during the running stride. The hamstrings have a hard time managing the braking forces, which takes some adjusting too. Many are finding that by using the Alter-G treadmill they can gain extra speed on their running time. When you learn to master the art of running at low-gravity, it is easier to keep up on a gravity full arena. Being able to increase the running time sounds good; however, some people develop hot spots in their shoes. This type of treadmill makes keeping up with a sustainable pace easier, but it won’t keep the blisters away. As a person picks up speed, their form will deteriorate. Using this machine takes a great deal of focus, especially when you’re going 800 at your MaxVO2. By lowering your levels, the effectiveness of the workout is lowered too. Simply fidgeting with the settings allows you to customize a workout and speed that is right for you. Unlike anything on the market, this treadmill is superior. After settling into a routine, many notice that their muscles don’t feel sore or heavy anymore. Over a process of time, speeds will increase where once they were lagging. Some say it is the magic bullet for runners. Since the gravity level is customizable, your fatigue may affect your levels. If you’re having a really good day, you should be able to do as much as 75-80 percent gravity. If it is a bad day, you can expect to get about 60 percent gravity. The goal is to keep the heart rate low, ultimately between 120-130 beats per minute. Users say they can run upwards of six miles easily. To keep things interesting, try messing around and increasing or decreasing the speed within a few tenths of a mile. You will soon learn your blister threshold and learn to stay close but not exceed that level. 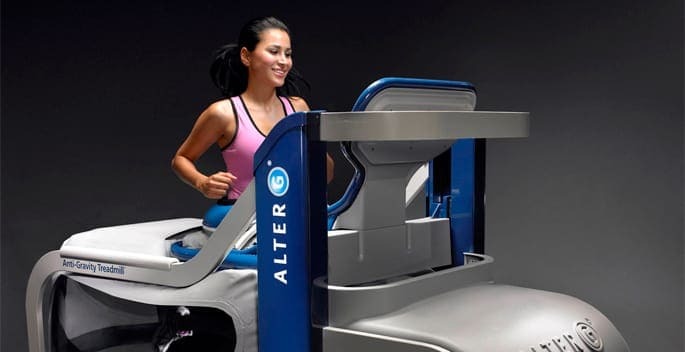 The Alter-G treadmill is a bit different than any other running experience you will have. You may find that you need to take your time to get used to it. It may not be comfortable at first, and your body is going to resist this new “less gravity” method of running. However, given some time, you will be able to master the machine and improve your strides and running times.